EPISODE 25 Can I Ever Be Effortlessly Slim? In this Thursday Therapy episode, Glenn reveals if you can ever be slim without effort, shares the best mindset to developing naturally healthy habits, and shows you how you can measure your psychological transformations with the Psychological Profile for Weight Management. Take the PSYCHOLOGICAL PROFILE FOR WEIGHT MANAGEMENT. See Glenn’s thoughts on becoming the resident psychologist for The Biggest Loser: Transformed. 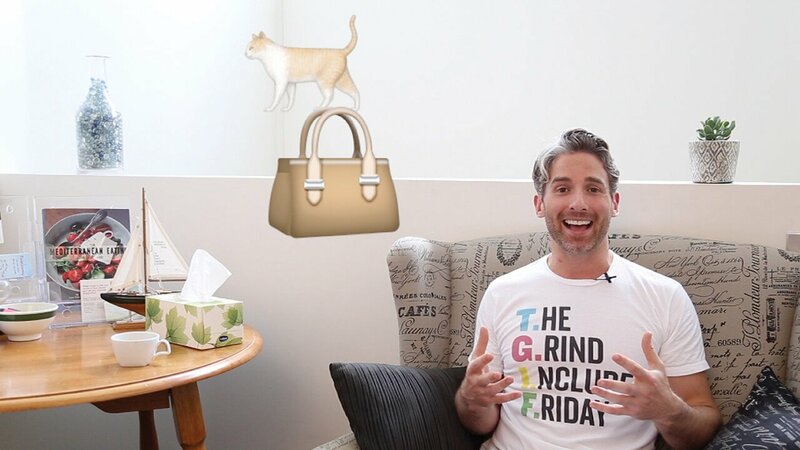 Welcome to Thursday Therapy, it is Glenn Mackintosh, the weight psych, and the question we’re answering today is, “Can I ever be effortlessly slim?” Hey everyone, welcome to Thursday Therapy and yes, the cat is out of the bag you haven’t heard? I am the resident psychologist on the rebranded, the Biggest Loser transformed. To hear my detailed thoughts on this exciting and challenging new role as well as a lot of other people’s thoughts, you can go to my Glenn Mackintosh public figure page but I will say that I am excited to be part of a new team that’s creating a more balanced holistic and positive version of the show. Probably the most balanced positive and holistic version that Australia and the world has ever seen, so that’s really exciting but for now let’s get to answering a wonderful question that I get in some form or another all the time and it comes from Jen, “My question is about having faith in my ability to sustain weight loss. Can I ever be effortlessly slim?” Jen this is an excellent question and it’s so important because your confidence in your ability to do something underpins everything as a rational human being which we kind of are if you deep down don’t think you can do something it’s really going to undermine your motivation because of course it’s not best use of your time to be spending all of this energy and effort and money on something you deep down don’t believe you can do. Of course, though, it’s very understandable if you’ve had a career of yo-yo dieting to deep down think can I ever get this right, so I’m really excited to give you my three main thoughts on this. Alright we’re going to start by ripping the band-aid off, the bad news, most people’s bodies are not designed to be effortlessly slim and if they are not all of those bodies are designed to remain effortlessly slim throughout the lifespan. Now, you might try to ignore this, you might try and fight it, you might try and work around it but for most people not everyone before most people this is a reality. I realize that this may be a bit disappointing to you but we do this every year with our 12-month transformation participants, we do our first workshop on goal setting and we hit them with the reality and they get a little bit disappointed, a little bit upset, a little bit disenchanted and now it’s a month past that workshop and they’re kicking goals based on understanding the reality, so what we’re doing is really the opposite of a diet; with a diet you start off with excitement then you end up with disappointment, we might have to start up with disappointment and then end with excitement, so what I’m going to do Jen is I’m going to reframe your question from, can I be effortlessly slim because the answer is potentially no and potentially that’s a good goal to let go of and I’m going to ask the question, can I ever be effortlessly healthy? can you ever be effortlessly healthy? The good news is pretty much yeah, you can. This doesn’t mean firstly, that it doesn’t require any work, so for example with some of our guys that we work with we might find that you know taking someone from hating exercise and never wanting to do it to really enjoying it or loving it might take a year to two years of work to make that happen, similarly with intuitive eating skills, those skills of how you eat well without trying, they’re great skills to build and they do become as the name suggests intuitive over time but we do know that they take at least six months to develop those skills and for some people even longer, so I would encourage you to think of it like raising a child or like building a business you know a lot of effort required at the start, a lot of nurturing, a lot of refining, a lot of developing and then over time it kind of becomes independent and it kind of takes care of itself, that’s not to say of course that from time to time you don’t need to jump in and give it some extra focus, so the good news is that you can learn to have fairly effortlessly healthy habits but how are you going to know when you’re in the place to do that. You can use how you feel which is an ok measure. You know I kind of feel in the zone but I don’t think it’s the best measure because if you’re like a lot of my clients you probably have times where you feel really good but then you swing into not feeling so good, so it’s not necessarily a measure of creating long-term naturally, healthy habits, you can also use what you do; I’m eating really well ,I’m exercising regularly as a sign and that’s probably a little bit better but again I don’t think it’s the greatest sign that you’re developing naturally, healthy habits because you’ve probably been there before where you have had times where you’ve been taking great care of yourself but that hasn’t been translated into the effortlessly healthy habit my preference by far is to use your mind-set and I want to introduce you to the psychological profile for weight management, it’s a free resource and will provide the link to it, it’ll take about 20 minutes or so to do and it really gives you a complete profile of how ready you are to create naturally healthy habits. Jen, I’m sorry it took so long to answer your question you are one of the original Thursday Therapy question askers but I really wanted to wait until this profile was completed. We spent years testing it working with some of the world’s leading academics and it’s just a beautiful free resource that’s available for all of you and what you can do is you can click through to the links and learn all about it but you can actually measure your mind-set for long-term transformation, so I’d really recommend that you give that a go. So, summing up today, bad news, your body may not be designed to be effortlessly slim, good news, you can learn effortlessly healthy, habits and even better news you can test them with the psychological profile. I want to let you know about an online course that we have coming up you can do it anytime but it starts on March twentieth, our next group where you get group support including from me and I’m really excited about it. It fits in with this Thursday Therapy beautifully because it’s actually called mind-set for transformation and it’s a seven-week online program where each week we learn one of the key mind-sets to developing long-term success with your weight management. I’m going to refer to previous Glenn from a video that we did up about this just to talk you through the seven key mind-sets. Take it away Glenn. In week one we develop mindfulness because awareness really is that first step to transformation. In week two we move on to motivation and I show you how to fan the fire of a burning motivation. In week 3 we move on to perspective because as you know your attitude can make this process harder or easier so we want to develop the perspective for transformation in wheat for we move on to balance a lot of yo-yo dieters swing between extremes of dieting and overeating and we want to help you find that sometimes elusive middle ground then we move on. In week 5 to patients as you know quick fixes are not the answer so we help you develop the patients that’s required for a laughing transformation as you also know sometimes this process is a bit rocky and it’s not without its setbacks, so in week six, we empower you to develop the resilience to deal with times when it gets tough. In week seven, we move on to confidence but the confidence that comes from just feeling good or in care of yourself for a week or two but that comes from having completed the other modules and developing a real and lasting psychological transformation good job good and of course as always we will provide after therapy watches with the code GMACK for anyone that wants a 10% discount, why wouldn’t you but I think the program actually really highlights the points that we were making today, you know we’ve called it mind-set for transformation, we haven’t called it mind-set for slimness, we’re working through the seven modules it is a fantastic program and people absolutely love it but there is work, so we don’t tell you that there’s no work to be done you have to create these mind-sets but at the end the last module is on confidence, we’re saying now you’ve developed these other six mind-sets you can really have a well-founded confidence and not only that you can measure it with the psychological profile for weight management. So, guys thank you so much for being part of another Thursday Therapy and of course if you haven’t already subscribed for regular sessions with me and if you like this if you think it would benefit anyone else please share it with them like I said before I’m really excited about doing this work with the Biggest Loser transformed able to get the messages out on such a broader level but for me it all kind of started here and this is where I get to speak with you guys directly. So, if you think anyone else’s benefit please share it with them until then I will see you in another couple of weeks at our next Thursday Therapy. Hey Buddy!, I found this information for you: "EPISODE 25 Can I Ever Be Effortlessly Slim?". Here is the website link: https://www.weightmanagementpsychology.com.au/episode-25/. Thank you.